Though much could be written about this story – and, I would add, I hope much is written about this because this is a story that needs to be thoroughly vetted – I want to offer two initial observations about this terrible, tragic report. I think the 20th century is perhaps the most complicated, convoluted century in the history of the world perhaps because I lived in it, but it had the worst evil. Hitler’s evil and Stalin’s evil are unmatched in the magnitude in the world … On the other hand, it was the century in which we really ended discrimination based on race and based on gender. We made tremendous scientific progress … So I think the 20th century has really proved that progress doesn’t operate in a linear way … We don’t evolve morally, we don’t get better morally as time passes. Morally, we must be continually careful and endlessly vigilant. We will never become so good that we are no longer bad. To quote the caution of the apostle Paul: “If you think you are standing firm, be careful that you don’t fall” (1 Corinthians 10:12)! The second observation I would offer on this story is that we are sadly deluded as a society if we decry the burning of fetuses on the one hand while supporting abortion on the other. There is a reason incinerating fetuses to heat hospitals has raised so many moral hackles. And it’s not because these fetuses are nothing more than “tissue.” Indeed, I find it quite telling that The Telegraph refers to these fetuses as “remains.” A quick perusal of a dictionary will find that the noun “remains” refers to “dead bodies,” or “corpses.” In other words, dead people. This is not just aborted tissue. These are aborted people. Aborted babies. But now these babies have passed. And to treat the dead in such an undignified manner as these UK hospitals have is unconscionable. 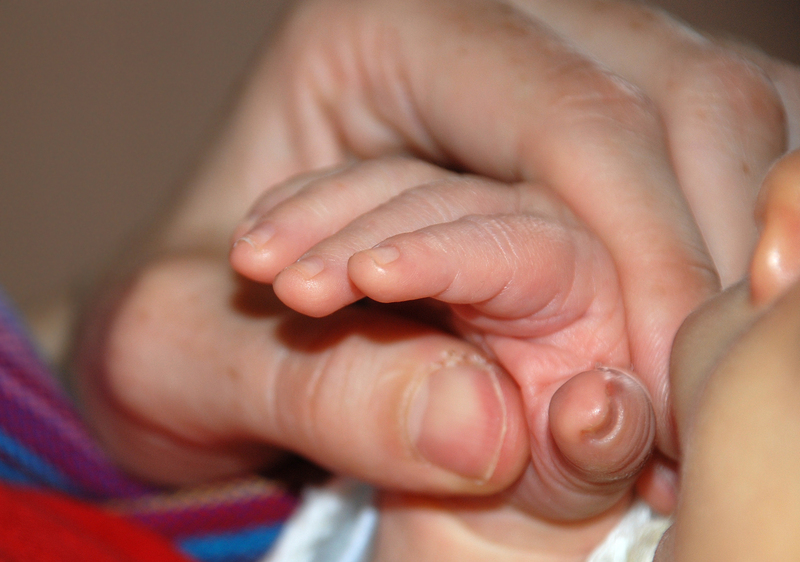 The difference between the passing of these babies, however, and the passing of others who die in hospitals is that these babies have died intentionally at the hands of abortion doctors. Yes, I am well aware of arguments for abortion that center on a woman’s right to do with her body as she pleases. But if she can do with her body as she wishes, I’m not sure why a hospital can’t do with its procedural remains as it wants. If it can throw away fluid drained from someone’s lungs in a biohazard bag, why can’t it burn a baby? Yes, I am aware that some may accuse me of making a fallacious “slippery slope” argument and they would counter-argue that you don’t need to ban abortion to decry the burning of fetal remains. But this counter-argument intimates that abortion is somehow a lesser evil than burning aborted corpses – an assumption I do not share. Indeed, I think abortion is a great and deep evil – but not just because I believe it deliberately ends the life of a child, but because I hate what abortions do to the women who suffer through them. Case in point: a recent study in The British Journal of Psychiatry shows that women who undergo abortions have an 81 percent higher risk of subsequent mental health problems. Nevertheless, proponents of abortion could claim that one can support abortion without sliding all the way down the slope into the moral morass of these UK hospitals. But I would point out that we already have, in fact, slid all the way down this slope. The charred now non-remains of 15,500 babies testify to it. So perhaps it’s time to repent and, by the grace of God, start scaling the slope – and not just halfway up the slope, but all the way off the slope. Human depravity warns us that if we don’t, we’ll slide right back down again. Sarah Knapton, “Aborted babies incinerated to heat UK hospitals,” The Telegraph (3.24.2014). Albert Mohler, “Moral Reasoning in a Secular Age: A Conversation with Professor Alan Dershowitz,” albertmohler.com. Priscilla K. Coleman, “Abortion and mental health: quantitative synthesis and analysis of research published 1995–2009,” The British Journal of Psychology 199 (2011), 182. Certain words should not be tossed around lightly. Persecution is one of those words. Religious right leaders and their followers often claim that they are being persecuted in the United States. They should watch their words carefully. Their claims are offensive; they don’t know the first thing about persecution. One doesn’t have to look far to find examples of real religious persecution in the world. In some countries, people can be imprisoned, beaten, or even killed because of what they believe. Certain religious groups are illegal and denied the right to meet. This is real persecution. By contrast, being offended because a clerk in a discount store said “Happy Holidays” instead of “Merry Christmas” pales. Only the most confused mind would equate the two. Go to Saudi Arabia, where it’s illegal to even open a Christian church, and experience the fear of those Christian believers who dare to worship in private homes, aware that at any moment they may be imprisoned. Visit North Korea, where all religions have been swept away and replaced with a bizarre form of worship of the state and its leader that purports to promote self-reliance but, in reality, merely serves as a vehicle for oppression. Visit any region under the control of the Taliban, a movement so extreme that, in Afghanistan, they trashed that nation’s cultural heritage by blowing up two sixth-century statutes of Buddha because they were declared false idols by religious leaders who are intolerant of any other faith but Islam. There is real religious persecution in the world. Right-wing Christians in America aren’t experiencing it. On the one hand, there are some things to affirm in Boston’s article. First, I agree that it is awfully tough to make the leap from someone wishing a Christian “Happy Holidays” rather than “Merry Christmas” to religious persecution. That is not only a questionable example of persecution, but a silly one. Second, I wholeheartedly and unequivocally affirm that compared to what Christians are experiencing in other countries, Christians who live “in the land of the free and the home of the brave” have it great. There is no reason – ever – for Christians in this country to compare themselves to Christians who are, let’s say, awaiting execution in North Korea. There’s always a “but,” isn’t there? For all of Boston’s bravado about how Christians in the States are not persecuted, I’m not sure he really understands Christianity or persecution. Boston rails against what he calls “right-wing Christians” and “religious conservatives.” Just in case we’re unclear as to what he means, headlining his piece is a picture of Glenn Beck, Phil Robertson, and Michelle Bachmann. His implicit message seems to be that those who claim that Christian persecution is taking place in the States are nothing more than puppets and parrots of conservative political groups. But this is not fair to the breadth or the depth of Christianity. Christian theology is much better defined in terms of “orthodoxy” and “heresy” rather than in terms of “liberalism” and “conservatism.” After all, Christianity is much more concerned with the right teaching of divine truths than with a particular 21st century political ideology. This is why there are Christians who are Republicans and Democrats. No earthly political party can claim a monopoly on the Kingdom of God. Second, though I understand Boston’s concern with Christians who brandish about the word “persecution” carelessly, I can’t help but suspect that he is guilty of precisely that which he rails against in his article. I find it strange that while writing about Christian persecution, Boston never pauses to consider what Christ has to say on the subject! So let’s do it ourselves. Jesus says, “Blessed are you when people insult you, persecute you and falsely say all kinds of evil against you because of Me” (Matthew 5:11). Notice that Jesus here explains persecution in terms of words rather than actions. Jesus says that people will both insult and tells lies about His followers. There can be little doubt that this does indeed happen – even in the United States. And this, Jesus says, is part of persecution. Thus, Boston’s stipulations on what qualifies as Christian persecution are far too restrictive – at least according to Christ. I am aware there is quite a gap between the definition of persecution theologically and the definition of persecution popularly. It is dangerous to throw out a word like “persecution” without any sort of background on how this word is used biblically and theologically. Hopefully, the dust up during the Romney campaign over whether or not Mormonism is a cult taught us that not all people define all words the same way. Thus, if we’re going to apply the word “persecution” to anything that happens to Christians in the States, we need to explain what we mean. Whatever you may think does or does not qualify as persecution, what is most important is how Christians respond to those who are against them. Boston says Christians have reacted to that which they perceive to be persecution with “so much carping.” This, I agree, is tragic. When Christians are persecuted, our response should not be one of carping, whining, or fretting. After all, according to Jesus’ Beatitudes, when we are persecuted, we are not victimized, but “blessed.” This is why, when the apostles experience physical persecution at the hands of the Sanhedrin, they leave “rejoicing because they had been counted worthy of suffering disgrace for the Name” (Acts 5:41). The Bible anticipated [persecution] years ago. The founder of Christianity, after all, was tortured to death and His original 12 followers were all persecuted; most were slain. Though His message was a Gospel of peace, His critics nailed Him to a cross but failed to keep Him in the tomb. They hated Him but could not contain Him. They sought to limit His influence, but they only broadened His impact. Ultimately, no matter how badly Christianity may be persecuted, threatened, belittled, cajoled, and legislatively restricted, it just won’t die. Why? Because its Founder lives. Robert Boston, “The ultimate guide to debunking right-wingers’ insane persecution fantasies,” Salon (3.16.2014). Cheryl Chumley, “Kim Jong-un calls for execution of 33 Christians,” Washington Times (3.6.2014). Richard Oppel & Erik Eckholm, “Prominent Pastor Calls Romney’s Church a Cult,” New York Times (10.7.2011). Robert Morgan, “The World’s War on Christianity,” Huffington Post (1.14.2014). Wow. That sure sounds shady. 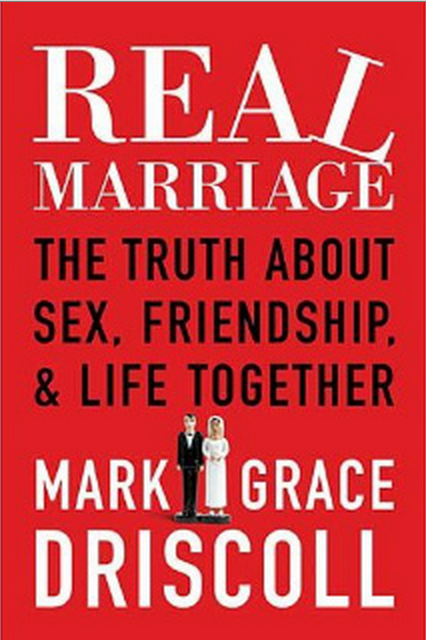 Did I mention the book in question is Real Marriage, written by famous mega-church pastor Mark Driscoll? And did I mention his church, Mars Hill in Seattle, shelled out, according to some reports, over $200,000 to get his book to the top of the New York Times bestseller list? In many ways, Mark Driscoll and I are kindred spirits. We share many of the same theological commitments. When it comes to preaching, we both believe a good sermon must not primarily be about what we are to do, but about what God has done for us in Jesus Christ. When it comes to Scriptural authority, both of us hold doggedly to the doctrine of inerrancy, even though some voices are seeking to discredit it these days. When it comes to salvation, we both believe that, contrary to our society’s pluralistic ethos, salvation is found in no one but Christ. We share a lot in common. But for all our theological similarities, what happened with Real Marriage represents a weighty ethical difference. This book launch strategy … wasn’t shocking to anyone who has been involved in the publishing industry … There have always been ways to underwrite the success of authors in any field, religious or not, when the efforts were attached to a deep enough bank account. Don’t doubt for a second, then, that some of Mark’s … counterparts haven’t done (or tried to do) the same. According to Cunningham, when it comes to cooking sales numbers, “everybody’s doing it.” But this go-to teenage quip is a sorry justification for what is a seriously unethical practice. We partner with authors to create and tap an audience – to connect the potential buyers of your book directly with the bookseller to leverage your launch potential. Our goal is to reach further than just typical launch management – our deep relationships enable us to create opportunities outside of what’s expected, to gain substantial traction within the critical “first 90 days” of your launch – or booksellers will send your book back to the publisher. Leverage our relationships with individuals in “Seven Channels of Influence” to promote your book. Research shows that people are influenced by multiple touch-points – and that our buying decisions are driven by as many as seven channels within our culture. Send email promotions to as many as 300,000 book buyers on our proprietary database of business and self-help book buyers. Write and design electronic promotions such as banners, excerpts, and Q&As. Build a powerful merchandising program with key retailers like airport booksellers, Amazon, B&N (Brick-n-Mortar and BN.com), Borders, Books-A-Million and independent outlets. The key to a winning book launch campaign is to have copies of your book in prominent positions at as many retailers as possible – and then drive sell through. Now, besides being a little leery of any company that makes selling a book through Borders (NYSE: BGP $0.00 +0.00%) a featured component of their marketing strategy, I am also deeply unsettled by the ambiguity of their claims. I honestly have no idea what they’re talking about. What are the “Seven Channels of Influence”? What, exactly, does it mean to “build a powerful merchandising program with key retailers”? And why don’t they mention that their primary strategy to drive sales is for this company to buy thousands of copies of a particular book in a way that dupes bestseller lists into believing thousands of people are buying the book? If a company can’t talk openly and honestly about the services they offer, perhaps they shouldn’t be offering them. Ultimately, I point out what happened with Real Marriage not to pick on Mark Driscoll, but because this scandal is indicative of a wider, toxic pattern that needs to be addressed. In this particular instance, I appreciate how the Board of Advisors and Accountability at Mars Hill has responded to this controversy, writing, “While not uncommon or illegal, this unwise strategy is not one we had used before or since, and not one we will use again.” I am glad to hear that. I hope others follow suit. I couldn’t agree more. If the prestige of being a New York Times bestselling author is so bewitching that a whole company can be created to help authors pay their way onto this list, something is terribly and tragically awry. We are defining ourselves by all the wrong things. Regardless of whether or not Mark Driscoll actually is a bestselling author, he is a child of God. So am I. And that’s good enough. Because, in the end, that’s what really matters. Carolyn Kellogg, “Can bestseller lists be bought?” Los Angeles Times (3.6.2014). Sarah Cunningham, “The Injustice of Silence: Why Our Culture Pulled Mark Driscoll Over For a Broken Headlight,” Huffington Post (3.6.2014). “A Note From Our Board of Advisors & Accountability,” Mars Hill Church (3.7.2014). Mark Driscoll, Who Do You Think You Are? Finding Your True Identity In Christ (Nashville, Thomas Nelson, 2013), 2. He’s a husband. He’s a father. He’s a follower of Jesus who can see himself becoming a pastor one day. And, oh yeah, he’s also an Olympic freestyle skier of halfpipe who won that gold. His name is David Wise. Wise is mature far beyond his years. At only twenty-three years old, he has a wife, Alexandra, who was waiting patiently in the crowd, and together they have a two-year-old daughter waiting for them to return to their home in Reno, Nevada. At such a young age, Wise has the lifestyle of an adult. He wears a Baby Bjorn baby carrier around the house. He also attends church regularly and says he could see himself becoming a pastor a little later down the road. When Wilder published his profile on Wise with this headline, almost immediately, people raised concerns and critiques. You can read some here, here, and here. Wise got married and had a kid at a far younger age than most people. According to data published by the National Campaign to Prevent Teen and Unplanned Pregnancy, the median age of the American first marriage is 26 and a half. The average age for an American bringing the first child into his/her homes: About 25 and a half. So, yes, David Wise is very good at skiing, and he figured out, as the Internet might refer to it, that whole adulthood thing much faster than the median American or median famous Olympian. The character Wise has and the lifestyle he lives at the tender age of 23 is far beyond his years. In this sense, it is alternative. But it is also hopeful. For a starting number, Acts 1:14-15 suggests that several months after the Crucifixion there were 120 Christians … Yet only six decades later, Christians were so numerous that Constantine found it expedient to embrace the church … Goodenough estimated that 10 percent of the empire’s population were Christians by the time of Constantine. If we accepted 60 million as the total population at that time … this would mean that there were 6 million Christians at the start of the fourth century. The Christian Church grew from 120 to 6 million in just over three centuries. That’s staggering! But how did it happen? Though Christianity’s rise is thanks to multiple factors – not the least of which is the grace of God – one reason Christianity showed such incredible growth is because it offered an alternative. It was different from the rest of the world. Most of our brother Christians showed unbounded love and loyalty; never sparing themselves and thinking only of one another. Heedless of danger, they took charge of the sick, attending to their every need and ministering to them in Christ, and with them departed this life serenely happy; for they were infected by others with the disease, drawing on themselves the sickness of their neighbors and cheerfully accepting their pains. Many, in nursing and caring for others, transferred their death to themselves and died in their stead. While everyone else was casting the sick out, Christians were bringing the sick in – many of them dying because of their efforts. Christians offered an “alternative.” And the Church grew. It is no secret that what Christians teach and the ways in which Christians live is out of step with our society’s Zeitgeist. We are “alternative.” But considering the pain, hopelessness, corruption, despair, emptiness, and oppression that our society’s Zeitgeist reaps (for examples, just look here, here, and here), don’t we need an alternative? So when someone calls us “alternative,” perhaps we should embrace the distinction. For we do offer an alternative. We offer the alternative of Christ to the mainstream of sin. And when we offer that alternative, we offer hope. And hope is an alternative that our world sorely needs. Skyler Wilder, “David Wise’s alternative lifestyle leads to Olympic gold,” NBCOlympics.com (2.18.2014). David Weigel, “Will This Young, Happily Married Olympian Start a New Culture War?” Slate (2.19.2014). Rodney Stark, The Rise of Christianity: How the Obscure, Marginal Jesus Movement Became the Dominant Religious Force in the Western World in a Few Centuries (San Francisco: Harper Collins, 1997), 5-6. Dionysius of Alexandria in Rodney Stark, The Rise of Christianity, 82. A funny thing happened on my way back from a recent trip I took to Arizona. The state became embroiled in a heated political battle over Senate Bill 1062. Okay, it may not have been funny. But these kinds of battles are common. According to some, S.B. 1062 championed religious liberty, allowing business owners with religious convictions to deny service to a party if the business owner felt that serving that party would substantially burden or contradict his religious convictions. According to others, S.B. 1062 violated the civil rights of homosexuals by formally and legally legitimatizing discrimination against them. Companies such as Apple Inc. and American Airlines, and politicians including GOP Sen. John McCain and former Republican presidential nominee Mitt Romney were among those who urged Brewer to veto the legislation. The Arizona Super Bowl Host Committee, which is overseeing preparations for the 2015 game, came out with a statement against the legislation. The Hispanic National Bar Association on Wednesday said it canceled its 2015 convention in Phoenix over the measure. In observing the volley between supporters and detractors of this bill, two things strike me. First, homosexuality – and, specifically, gay rights – is not only a hot topic in our society, it is the hot topic in our society. Interestingly, nowhere does S.B. 1062 mention homosexuality. It simply speaks of “the free exercise of religion.” Yet, USA Today reported on Governor Brewer’s veto of the bill with this headline: “Arizona governor vetoes anti-gay bill.” These days, how a piece of legislation will affect the gay community is the litmus test as to whether or not a bill can or should pass, even if that bill does not specifically mention the gay community. Gay rights, then, are front and center. They are the battleground du jour of our society. Second, there are a lot of homosexuals who deeply despise Christians with orthodox beliefs concerning the sinfulness of homosexual activity and will go to great – and even duplicitous – lengths to paint Christians as homophobic bigots. Stories abound of people who have concocted heinous hate crimes against themselves. Take, for instance, the lesbian couple that spray-painted their own garage with the message “Kill the gay.” Or how about the Tennessee man who falsely claimed that three men beat him and robbed his store in an anti-gay attack? Then, of course, there was the famed incident of the waitress who falsely claimed she was stiffed on a tip because she was a lesbian. Personally, I don’t want to think of anyone in the homosexual community as my enemy. Life is too short to keep an enemies’ list. But I am not so naïve as to believe that there aren’t some in the homosexual community who think of me as their enemy. Jesus’ admonition to pray for those who are on the outs with you (cf. Matthew 5:44) seems to be especially apropos for a time such as this. To this end, I would invite you to join me in praying for three things as the culture war over sexual rights continues to rage. 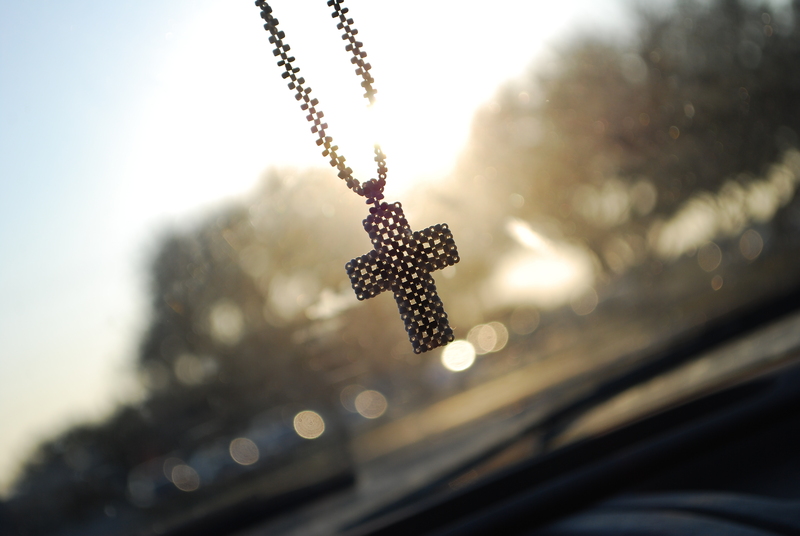 First, pray for forgiveness. Though it is painful to admit, it was not too long ago that it was exponentially more likely for a message like “Kill the gay” to be spray painted not by someone self-imposing a hate crime, but by someone committing one. And sometimes, that someone was even a self-professed Christian. This, of course, directly defies a myriad of biblical commandments concerning our conduct as Christians. Our call to tell the truth about sin must never be a license to commit sin – especially the sin of hate. We need forgiveness for our missteps – which are plenty – in this debate. Second, pray for understanding. I want to be understood. I want people to understand and believe that I am not a homophobic hate monger who wants to oppress, humiliate, and exile those who do not share my same faith and ethical commitments. But if I want this for myself, it is only fair that I afford the same courtesy to others. Martin Luther summarized the Eighth Commandment by saying that, when dealing with our neighbors, we should “put the best construction on everything.” I can think of no better way to respond to those who put the worst construction on Christians’ intentions than by putting the best construction on theirs. Generous understanding offers our greatest hope for peace in the midst of a hotly contested and, sadly, dirtily fought culture war. Tolerance does not seem to be the high brow Scriptural virtue that some would like to peddle it as. This is not to say that we shouldn’t live with, work alongside with, and care for people who do not share our same moral commitments. In this way, we should indeed be tolerant. But tolerance does not necessarily entail endorsement. Ultimately, as Christians, we ought to aspire to a much higher value than that of tolerance. We ought to aspire to love. “Love,” the apostle Paul reminds us, “does not delight in evil but rejoices with the truth” (1 Corinthians 1:6). To love someone well, we must tell him the truth, even when the truth is unpopular. This is our calling with all sin – sexual and otherwise. So these are my prayers. Now, it’s your turn. Will you join me in praying the same? S.B. 1062, 51st Leg., 2nd sess. (Ariz. 2014). Aaron Blake, “Arizona governor vetoes bill on denying services to gays,” The Washington Post (2.26.2014). Bob Christie, “Arizona Religious Bill That Angered Gays Vetoed,” ABC News (2.27.2014). 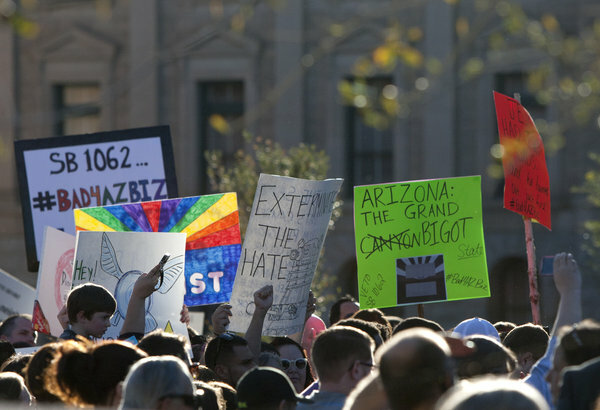 Dan Nowicki, Yvonne Wingett Sanchez and Alia Beard Rau, “Arizona governor vetoes anti-gay bill,” USA Today (2.26.2014). Alyssa Newcomb, “Lesbian Couple Charged With Staging Hate Crime,” ABC News (2.19.2012). Chuck Ross, “Report: Man falsified police report in alleged anti-gay attack,” The Daily Caller (12.26.2013). Cavan Sieczkowski, “New Jersey Waitress In Anti-Gay Receipt Saga Reportedly Let Go From Job,” The Huffington Post (12.9.2013).